You can reduce the number of graphs by selecting a sub-set of hosts from the menu on the left. 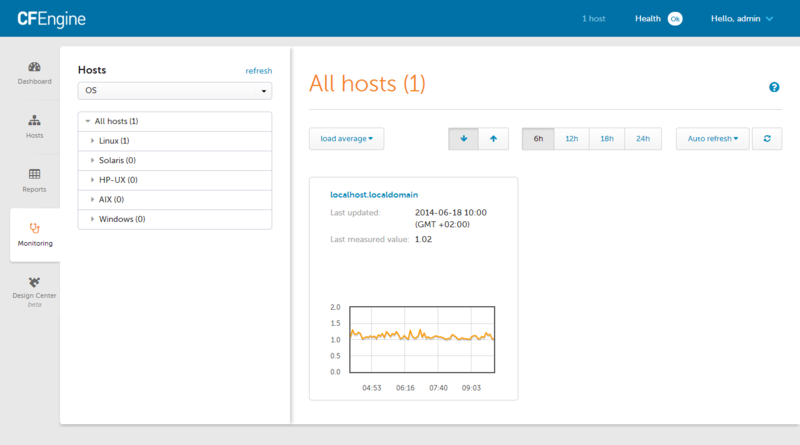 If only a single host is selected, then a number of graphs for various measurements will be displayed for this host. Which exact measurements are reported depends on how cf-monitord is configured and extended via measurements promises. Clicking on an individual graph allows to select different time spans for which monitoring data will be displayed. cf-monitord is running on your hosts. cf-hub has access to collecting the monitoring data from your hosts. See Configuring Enterprise Measurement and Monitoring Collection in the Masterfiles Policy Framework.